Diplomatic Protocol explores the etiquette of diplomacy, without which all efforts to negotiate would flounder. In a world of instant communications, and the growing informality and influence of social media, the rules of diplomatic exchange have never been more important. They are not there to restrict but to enable. 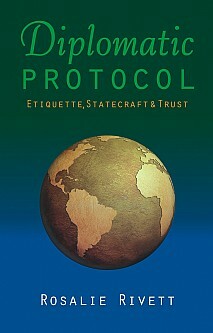 This book provides examples both modern and old, from taking up a post for the first time to departing a mission, where diplomatic protocol has been successful and where diplomacy has failed. Without a clear understanding of the practicalities of diplomatic protocol no aspiring ambassador can hope to succeed. With the benefit of first-hand international experience working with the diplomatic, political, military and business communities, the author offers a unique perspective on the challenges facing a troubled world and as a university lecturer, public and external examiner in diplomatic studies, she brings a current interpretation of a subject which is increasingly recognised as being essential in international affairs. From NATO HQ in Brussels and the Quai d’Orsay in Paris, from the United Nations to many of the royal palaces of the world, Rosalie Rivett is able to reflect from a privileged position on the past, present and future direction of diplomacy. Diplomatic protocol may be well-established but its interpretation and correct application in a rapidly-changing and complex political environment could not be more relevant. This is essential reading for Diplomats, students of Diplomacy and International Relations and negotiators, also for those in commerce and the military who move in diplomatic circles.